Once again, net neutrality has taken up most of the space in the telecom policy debate this year. FCC Republican Ajit Pai rose to chairman and quickly introduced a proposal to roll back the hard-fought net neutrality protections that the agency put in place in 2015. The unpopular proposal generated an unprecedented amount of public feedback—and outrage—throughout the year, with the debate culminating in a controversial and heavily-protested party-line FCC vote in December to repeal the 2015 rules. In 2017, the makeup of the FCC changed significantly as Chairman Pai was confirmed for another term at the FCC during 2017, former Democratic Commissioner Jessica Rosenworcel was reconfirmed and reinstated on the commission, and the commission slot opened by the departure of former Democratic Chairman Tom Wheeler was filled by Republican agency staffer Brendan Carr. In April, FCC Chairman Ajit Pai announced his plan to roll back the 2015 net neutrality rules, which prevented ISPs from blocking or slowing access to certain websites or charging websites for special access to users. While Pai and his friends in the ISP lobby say the move merely frees ISPs from burdensome and unnecessary regulation, startups, innovators, Internet rights groups, and everyday users know the proposal is meant to let ISPs use their gatekeeper power to line their pockets. More than 1,300 startups, innovators, and investors joined a letter urging the FCC to keep the 2015 rules, making it clear just how loudly Pai’s claims that his repeal will help startups ring hollow. And that frustration with Pai’s plan was evident in the public’s participation in the FCC process. During the first open comment period early in the year, more than 10 million groups and individuals filed comments. By the end of the reply comment period a few months later, the total had risen above 21 million. Engine filed comments in both the initial and reply periods, highlighting the importance of the rules to startups and the levels of venture capital investment in the startup ecosystem based partly on strong net neutrality protections. But the comment process was not without controversy. Early on, the FCC’s comment system suffered an outage—a common occurrence when it’s flooded with comments—which Pai attributed to DDoS attacks. Skeptical congressional Democrats called for investigation into those claims, and the Government Accountability Office agreed to conduct the investigation. As the comment period progressed, criticisms came from all sides claiming that many of the millions of comments in the docket were fraudulent. New York State Attorney General Eric Schneiderman accused the FCC of failing to cooperate with his investigation of the misuse of New Yorkers’ identities in comments to the FCC. One study found that slightly more than half of the comments contained false or misleading personal information and that a small percent of the comments were unique, with seven frequently-submitted comments (six of which were pro-repeal) making up 38 percent of all submissions. According to another study, 98.5 percent of unique comments opposed Pai’s plan to repeal the rules. Without addressing either the problems with the comment process or the anti-repeal comments themselves, the FCC approved Pai’s plan with a 3-2 vote in December, setting up a continued fight over the issue in the courts and in Congress. States attorneys general have already announced their intention to sue, and congressional Democrats are planning to force a vote on the issue. Lawmakers pressed ahead with their efforts to open up more spectrum for commercial use. Senator Maggie Hassan (D-NH) and Senator Cory Gardner (R-CO) introduced a bill—the Advancing Innovation and Reinvigorating Widespread Access to Viable Electromagnetic Spectrum, or AIRWAVES, Act—aimed at freeing up government-held spectrum for commercial and unlicensed use. The Senate passed the MOBILE NOW Act, a bill from Commerce Committee Chairman John Thune designed to boost the next generation wireless network. After a months-long delay, the Senate confirmed former Energy and Commerce Republican staffer David Redl to lead the National Telecommunications and Information Administration, the agency that oversees federally-held airwaves, among other things. Engine supported Redl’s nomination, and we were pleased to see him confirmed. 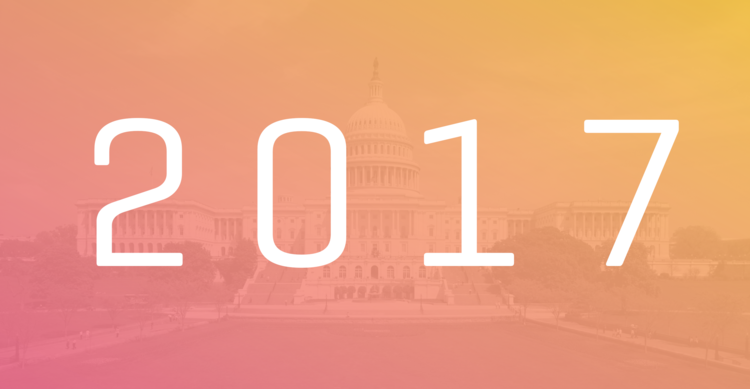 The bipartisan push for increased broadband access continued in 2017. Trump traveled to Iowa over the summer to highlight the need for Internet connectivity to promote innovation in agriculture technology, and 5G got a shoutout in Trump’s National Security Strategy report. Meanwhile, Democrats in Congress included a push “to bring Internet to every farm, school, and neighborhood” in their “A Better Deal” platform. Less bipartisan was the FCC’s consideration of its annual and congressionally-mandated report about wireless competition. For the first time since the last time a Republican was president, the agency issued a report saying that the wireless market in the U.S. is competitive, potentially laying the groundwork to justify deregulatory steps in the wireless space. The party-line vote approving the report came after the FCC’s two Democrats heavily criticized the process and amid talks about a merger between Sprint and TMobile, which have since been abandoned.